A Parent's Life to Behold, Through the Eyes of Insanity-n-Bliss...: A Valentine's Day Giveaway Full of Hugs and Loves that are So Stinking Sweet You'll Want to Scream! A Valentine's Day Giveaway Full of Hugs and Loves that are So Stinking Sweet You'll Want to Scream! Ohhhhhhhhh joy! It's February and luuuuuuuuv is in the air! Actually, the smell of chocolate is in the air, and it is taking everything I have within me to NOT buy those heart-shaped boxes full of chocolates at Rite Aid, and walk right outside those automatic doors, and swallow all 40 of them whole, tossing the box in the garbage can next to me. Especially when they are 50% off. So Stinking Sweet on Etsy has graciously agreed to again hold a giveaway on my lil' blog! Her soaps are, well, SO Stinking SWEET! I love them! Just look at those wonderful concoctions of cleanliness! Click on them and learn about all of her soaps!! Soaps made with the highest quality ingredients, including goats milk, and even vegan soap! Soap for everyone!! And she has body souffles and lip balms and perfumes and and and and YAY!!!!!!!! Aren't you just rolling in dirt right now, getting all filthy, anxiously waiting to see what you get to wash off with if you win? Well, here it is! OH YUM! The prize is a pair of Juicy Baby Ruby Red Grapefruit Valentine Heart Conversation Shea Butter Soaps! Say that 10 times fast! And, not only is this soap as sweet as can be, it has BODY SAFE GLITTER in it, so you're all smelly good and sparkly pretty too! Gotta love the sparkly! -Tell me your best (or worst) Valentine's Day gift ever (worth 1 entry). -Tweet this giveaway! You can do this once per day until the end of the giveaway, leaving me a daily comment with the daily tweet link (worth 1 entry, per tweet, per day). -Blog about this giveaway, come back here leaving me a comment with the link (worth 5 entries!).. -Buy an item from So Stinking Sweet during this giveaway, and leave me a comment. Once it is verified you will be given credit (worth 10 entries!). Oh man I wish I could enter! This giveaway runs February 1st-10th, 2010. The winner will be selected via the Random Number Generator (RNG) on 2/10 at 12pm, EST. The winner has 2 days to contact me, and in the event that the winner is hiding in a corner, eating chocolates and therefor misses my e-mail, I will have the RGN choose a new winner. A great prize in your hot and chocolate-smudged hands before V-day! Woot! AND check out my side bar for two other luscious giveaways happening at this very moment over at Sounds Like Tomatoes and Much More Than Mommy! You plan this right, you won't have to buy ANYTHING at all for Valentine's Day! WOOOOOT! Good luck to you! I hope you win! And by you of COURSE I mean you! there's so much to like at So Stinking Sweet, but I guess I'll pick Pink Sugared Marshmallow scented All Natural Whipped Cream Soap. What's not to love? dang it lol sorry, here's the link! Who doesn't want a jasmine body souffle? Love how cheerful they are! Hmm...well I loved when I was in grade school when you would get a valentine each year! I'd love the water lily and jasmine whipped body souffle. Thanks for the giveaway! so many great choices! I guess with Valentine's Day on the way, I would say I am loving the Five Valentine Heart Conversation Soap with Shea Butter. My best Valentine's Day would have to be last year. Money was tight, so my hubby made me chocolate covered strawberries (which I love). It was a very sweet and thoughtful gift! My favorite is the neopolitan ice cream soap - what a cute idea! http://www.etsy.com/view_listing.php?listing_id=39794515. 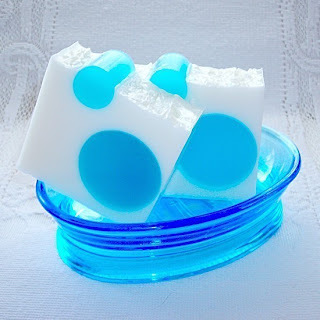 I love this Invigoration Handmade Shea Butter/Glycerin Soap! Love the colors! Best gift--a homemade Valentine from my little brother. Too many to chose from! 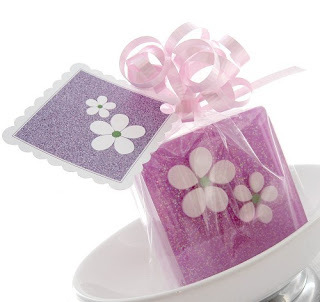 I love the coconut flower soaps and the Popsicle soaps! Worst Valentines Day gift ever....the day when just about all the girls got a candy gram at school, but I did not :( The non gift. I love these soaps, the Five Heart Valentine Conversation Soap with Shea butter: http://www.etsy.com/view_listing.php?listing_id=39658299. Such a sweet gift for a sweatheart! Best gift--a kiss from my hubby.. whether it's Valentine's or not! the chocolate and banana soap. my best valentine's day gift ever was a plastic heart with skittles in it. it's true. mainly because we don't really do gifts on valentine's day... so. yeah. Woah. That's some artistic looking soap. My favorite would probably be ... the Sweet Pea. That would just look so pretty next to the sink. My worst "gift", by far, was from my sister. She tore up the card I had given her, stuck the pieces in an envelope, and returned it to me. I remember crying the rest of the afternoon ... definitely the worst thing ever. Five Valentine Heart Conversation Soap with Shea Butter are sooooo cute!!! LOVE all the conversation heart soaps, and this little beauty: Stiletto Blonde Shea Butter Soap. Thanks for helping me find a new etsy shop to LOVE! I like Strawberries and Cream Soap. Oh my! I thought I knew what my favorite items was right off the bat and then I kept scrolling down. I vote the popcicle soap... so cute. Wost Valentines Day ever? Well, pretty much all of them because I've NEVER been given a Valentine by a dude. My husband refuses to celebrate but he does make up for it with wacky President's Day gifts... so it's okay with me. I celebrate Valentine's Day with my girlfriends. My worst V-day was last year when I had to work until 3am (I work in a restaurant) and we ran out of ice, glasses and the computers broke in the middle of the CRAZY busy shift! I cried and didn't even get to spend the night with my boyfriend because he was asleep by the time I finally got home and I felt bad waking him. The Neopolitan Ice Cream Soap is my fave! My best Valentine's Day Gift is what I am getting this year! The hubby got us a night in a king sized whirlpool suite with a romance package that includes breakfast in bed and champagne! I can't wait! I favor the Sweet Pea Scented Soap with Shea Butter. I'm W's sister and she demanded that I tell you she sent me here. Best Valentine gift - One of my 2 sons was born on Valentine's Day - that was a pretty special gift. I love the cupcakes! and the Blonde Stilleto roll on perfume. In fact I now a list of "wants" from this etsy shop! this neapolitan reminded me of childhood weekends and eating this ice cream! my husband thinks it's a hallmark made up day. i'm lucky to get flowers and candy. half the time my card says ...'happy birthday gma'....hardy har. i'm teaching my boys about the day of ♥ ! i do special things in their lunches each day in the month of feb.
ok i did have a good vday....in the 3rd grade patrick flannigan gave me a huge heart box of chocolates! The Best Valentine's gift----was the HDTV that is in the master bedroom!! i hate to pick, because they're all so stinking cute. but the karma kazi shea butter soap seems coolio. Neapolitan Trio Scalloped Hearts Shea Butter Soap. So many fun items to choose from! worst v-day present...a break-up. no, i'm not kidding! I love this lip balm - peach and coconut! Yahooo! Best Valentine Gift is every day I have with my loved ones! My best valentines day was the year my husband got me an Alaskan Malamute puppy. http://www.etsy.com/view_listing.php?listing_id=36592693 is my fave! Big body cream person! Worst, a T-shirt. No chocolate or flowers. My best Valentine's day gift was my getting Cheyenne, my (now) 3-year-old Shiba Inu. OMG I love love these soaps! Id love to win these! 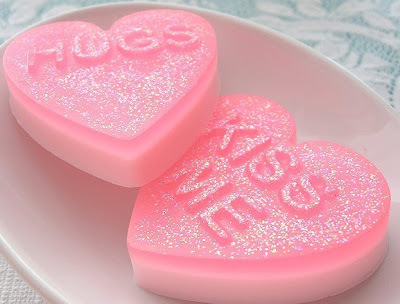 I also love the Valentine Hearts Five Soaps they are so cute!! Pick me pick me! Love, love this soap!! 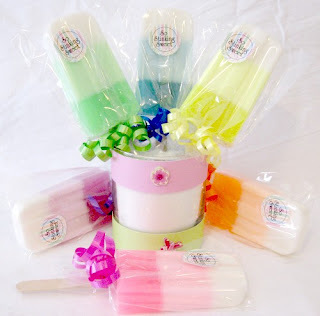 Right now my fav is the Popsicle Soaps Handmade Novelty Glycerin Soap! So cute!! I'd love to try the Goats Milk Soap Blue Bubble Gum. It looks so neat! I think I am too late. but if I am not than whoooohoooo.